I still remember when I joined my first job. In our office campus, there were people with 10, even 12 years experience. They were easy to recognize by their id cards that had become pale yellow in contrast to our sparkling white ones. They seemed to know how the industry worked and were deeply valued by the company as well as freshly minted graduates like us. Cut to 2018. The seniority that used to be an asset, is more and more looking like a liability. As per data from CutShort and other job platforms, (reference), only 15% of jobs posted in 2017-18 were okay with accepting people with 10+ years experience. A whopping 70% of the jobs preferred people with less than 5 year experience, thus showing the clear preference of employers to hire younger talent. These numbers may be a bit skewed since most jobs are posted by smaller companies than the bigger ones, but given the overall sentiment these numbers may not be far off from the general trend. Think about it for a second. Only 15% of jobs for a section of people that is around 50% of the total workforce in the Indian IT industry (reference). That’s a huge demand supply gap! So why there are fewer jobs for senior folks now? Don’t get confused – experience is still a big asset for jobs that have a longer learning curve and need practical experience to become better. Jobs in areas such as finance, legal or operations are where you mature over time by facing different situations. In these jobs you get more efficient as you gain more experience. But that’s now how the new knowledge economy works where skills change every 2-3 years. Knowing older stuff is less valuable, and heck – is sometimes even a barrier to learning something radical faster. So, is seniority really a burden? If one has just clocked more number of years doing the same thing over and over and learning very little new stuff, every passing year is definitely a liability. But if you have been taking risks and learning new stuff that’s coming up now, you will not only prevent value erosion, but actually bring a tremendous amount of value to the table. This trend is not a secret anymore. But why then people are slow to react? Denial: Brain’s first emotional response to any negative news, denial makes people look for examples where this trend is contradicted. My boss, that colleague – they all are doing just fine. ; There is no need for me to change. Inertia: I probably need to do something. Someday. Fear of the new stuff: I’m too old to learn this new shiny thing like data science or viral marketing. Risk averseness: What if I fail. It’s better to stick to what I’m doing and get 10% better at it. This new thing won’t pay me enough: I have earned these promotions after a lot of hard work. Can’t start from scratch and be paid like a fresher again. What can you do to stay relevant? Be curious. Have an open mind. Be fearless. Narrowing your world view is the surest way to get out of sync with the times. Will try to cover this in more details in a follow up post. Please comment below if you want that post to come soon! Based on jobs posted in last 1 year on 5 major job platforms analyzed by CutShort. the IT industry directly employs 3.9M people today. 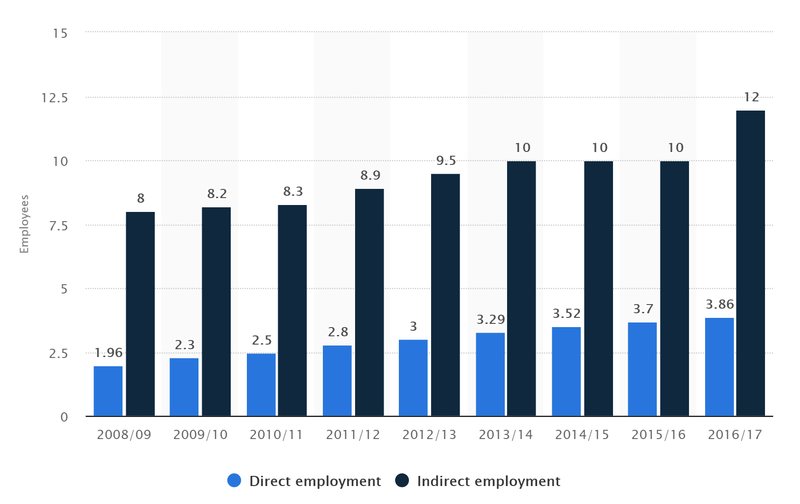 The 1.9M people that worked in 2008 would all have 10+ year experience today and hence would be more than 50% of the current headcount.